The posts for TROAX® partitioning systems allow you to erect the free-standing warehouse partitions safely and securely. The base plate ensures that the post, and thus also the partition, is perfectly stable. With the corner connector for the TROAX® partitioning system, you can connect two doors at a 90° angle. 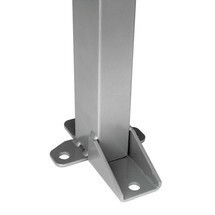 The solid bracket features pre-drilled holes for establishing a secure bolted connection. The posts for the TROAX® SMART FIX™ partitioning system provide a machine guarding mesh panel its basic stability. Each element requires a separate post so that a secure connection can be established. With a raising foot for TROAX® partitioning systems, you can secure the wall and add-on elements at corners or against a wall. You can combine the partition elements to create your own customised, highly stable system. With the corner connector for the TROAX® partitioning system, you can join two machine guarding panels via a bracket. This ensures a secure connection. The levelling piece is available as an accessory for the TROAX® partitioning system. It ensures perfect alignment of the individual wall elements. The U profile for the TROAX® partitioning system enhances the stability of the mounting system. The profile is simply attached to the top of a mesh panel. This raising foot enables angled installation of machine guarding partitions. The raising foot with corner connector completes your TROAX® partitioning system to provide you with robust, reliable protection. The levelling piece for TROAX® professional machine guarding is used to adapt to different dimensions. This ensures maximum stability of the connected wall elements. The levelling piece for TROAX® standard machine guarding is used to adapt different dimensions. This ensures maximum stability of the connected wall elements.